Please stop by the Matthews-Fuller Health Sciences Library on the 5th floor of DHMC (right above the Main Entrance) to see Judith’s work. Judith is a colorist, exploring shapes formed by shadows and light, threading colors on their way from the gaudy to refinement. Her perception of the richly patterned countryside focuses on a continuing investigation of the colors in nature and the seasonal changes, always filtered through imagination and memory. 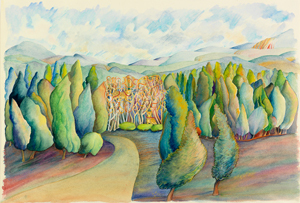 As a landscape painter, her technique in gouache presents broad vistas as well as details, using her immediate environment of the Connecticut River Valley of Vermont and the White Mountains of New Hampshire, and travels. Though best known for landscapes, she also produces paintings of botanicals each summer – a series of lotus dancing, roadside wildflowers, and garden flowers. She has been a printmaker, an art director and designer of record album covers, and a book illustrator. She received her BFA from the University of the Arts, in Philadelphia, and completed graduate work in Classical Archaeology at the University of Pennsylvania. Her paintings and prints have been the subject of many solo gallery and group exhibitions in New York, Boston, New England, Washington, D.C., and London; and her paintings have been represented in the U.S. Department of State’s Art in Embassies program. Lerner is represented in public, private and corporate collections including the De Cordova Museum, the First National Bank of Boston (Bank of America), the Philadelphia Print Club (The Print Center), the New Hampshire State House, and the Fletcher Allen Health Care Hospital in Burlington, Vermont. The Seasons, a four panel mural series of Vermont landscapes, was commissioned by the Vermont Council on the Arts, and is installed in the Franklin County Courthouse in St. Albans, Vermont. Lerner moved to Lyme, NH in 1971 and joined the beginnings of AVA Gallery in 1973. Work can be seen in the studio by appointment, on the website, and during Open Studios throughout the Summer and Fall seasons, and as currently represented by Burlington City Arts.